You all know how I whine over eating the blah oatmeal for breakfast. But, over time, to my surprise, I happen to appreciate it. With mercury falling day-by-day, I am not up for cold cereal either. There is no denial that oatmeal is, by far, one of the healthiest breakfast you can have. “What cannot be cured must be endured”, says my dad. So, instead of whining, I decided to dress it up, making breakfast a treat, than a chore. Being vegan or not, I love soy milk with my cereal or oatmeal. It lends a sweet flavour without the cholesterol. But if soy milk is not your thing, you can use regular milk. I perk it up by adding a dry fruit and a nut and/or seed. Dried berries, raisins would work too. Try unsalted, roasted pepitas, for something different. Since I decided to make one of my favourite combinations today, which is dates and pistachios, I am sending this to Chandrika’s AFAM – Dates. Bring water to a boil. Add oats and cook until soft, about 3 minutes. Add flax seeds, switch off the flame and add soymilk. Garnish with dates and pistachios and serve warm. I'm sold - I'm trying that this weekend! Hey that pictures looks great!! I have never seen anything simple looking so beautiful!! love your new header, its beautiful!! beautiful pic and even more lovely is the idea. healthy and lovely! kaykat is right, suganya! i never knew oats porridge could look so inviting. beautiful pictures. Hi!I just happened upon your recipe. Adding the flax seeds is a great idea but may I suggest roasting and grinding them first? That is nutritionally better. The new header and the looks in all look PERFECT..
Tasty pallettes is looking tastier these days! What with new pictures on the header! :) The Oat meal is looking awesome! :) Dates pista, yum yum! My son has oatmeal for breakfast every single day:-) The presentation with the dates and nuts looked so good. At first I thought it was some kind of pudding. Looks soooooo good. New header loks nice. Nice to see a new way to eat oats, though I prefer mine savoury. Thank you guys. Glad you liked my version of oatmeal. And, many of you did notice my new header and the 3-column template :D. Well, its encouragement from friends like you that pushes me to go further! AJ, Thank you for the tip. I add ground flax seeds to smoothies and breads that I bake, but not to my oatmeal. I just love the crunch, I guess :). BTW, roasting nuts or seeds depletes its nutritional value, its better to have them raw. This is what I learnt from a Doctor's article. 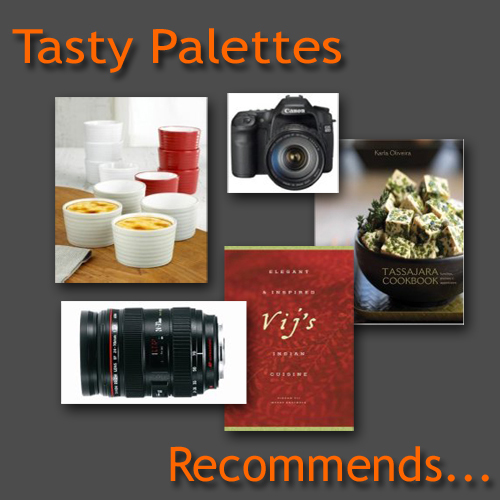 the photo looks lovely, like tapioca pudding:) but how does flax seed taste like? Beautiful!!! this is the nicest looking oatmeal i have ever seen!!! Very pretty looking oatmeal :). This will tempt the non-believers too :-D.
Lovely pic!! I should give a try this . I love adding dates to my oatmeal too... either with bananas or apples and some walnuts for crunch. Like you new templet. Delicious and nutirious oatmeal, can eat this every day. If only if someone served me oatmeal that fancy..
Whats not to like here. 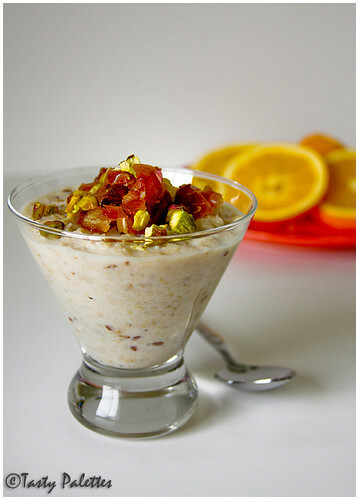 If our daily oatmeal looks as lovely as this, we would be much more inclined to look forward to it. A very pretty start to the day. The oats look so wonderful. I love organic oats - they have quite a different taste and are so creamy. This one is a lovely recipe and a wondeful photograph - I made a something similar to this recipe using quinoa - except cooked it in milk and dates combined.